As a child She came to North America and studied singing at the conservatoire of Milwaukee. In 1921 she returned to Romania, where she continued her education with Jenny Czolak in Craiova. In the end, she became a pupil of Tina Scognamiglio in Milan. She made her debut as mezzo-soprano in 1921 at the Municipal Theater of Cluj as Siebel in ‘’Faust’’ by C. Gounod. 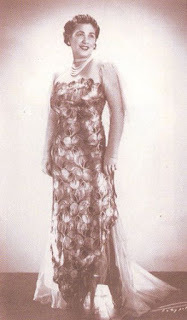 In 1928 she went to Italy and now appeared as soprano. In 1931 she appeared at the Teatro Alla Scala as Freia in "Rheingold", in addition she sang at several Italian provincial operatic stages. In 1932 she returned to Romania and made guest appearance in Budapest as Violetta in ‘’La Traviata’’. From 1934 to 1944 she was engaged by the Bucharest Opera and guested in Temesvar, Cluj, Czernowitz (Tschernowzyn) and Jassy, in 1942 also in Odessa. Then she lived in Cluj, where she was active in the educational area.